Laboratories and laboratory buildings - Vinco Sales has recently supplied a new 20ft x 9ft plastisol coated steel jackleg cabin which has been designed for use as a laboratory for a local animal hospital in Herefordshire. Jackleg cabins were suggested has a convenient and cost effective solution to their portable building requirements and needs. Anti-slip vinyl flooring was fitted throughout with double glazed tilt and turn windows and secure UPVC doors. The clients own existing stainless steel lab bench was installed as part of the overall project and finally delivered by way of a Hiab lorry within an agreed time frame. 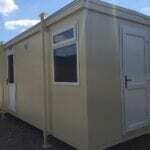 Jackleg cabins provide a safe and comfortable working environment as any permanent structure can, but are much lower in cost and delivery and installation can be almost immediate. 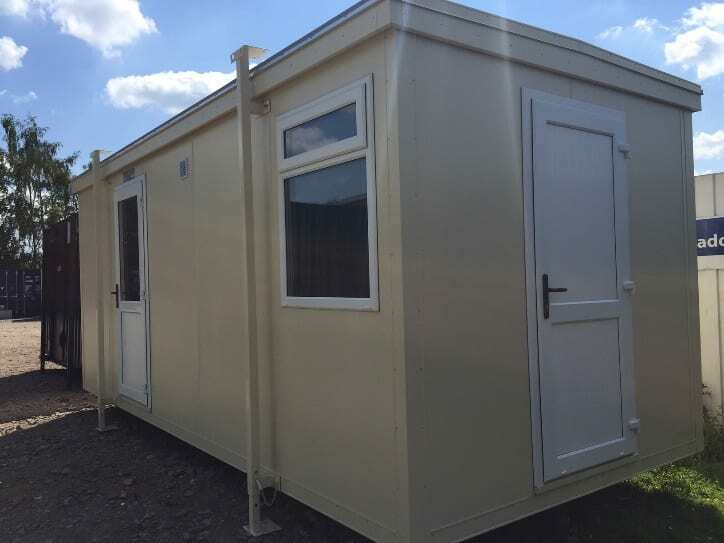 These portable buildings will still give many years of trouble free use, and can be kitted out with all the facilities you would expect from a permanent building, such as toilets, kitchen, water, electricity and heating. Modular laboratories are buildings that can be moved easily from one destination to another. Portable labs have become an important resource for government, industry, schools, medical and military security applications.